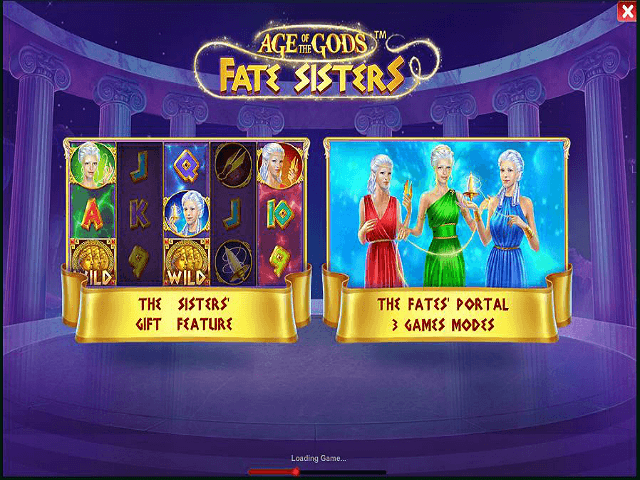 Discover your destiny in the mythical world of the Age of the Gods: Fate Sisters slot. This action-packed medium variance progressive jackpot game has been developed by industry giant Playtech and is played across the standard five reels and 25 paylines. 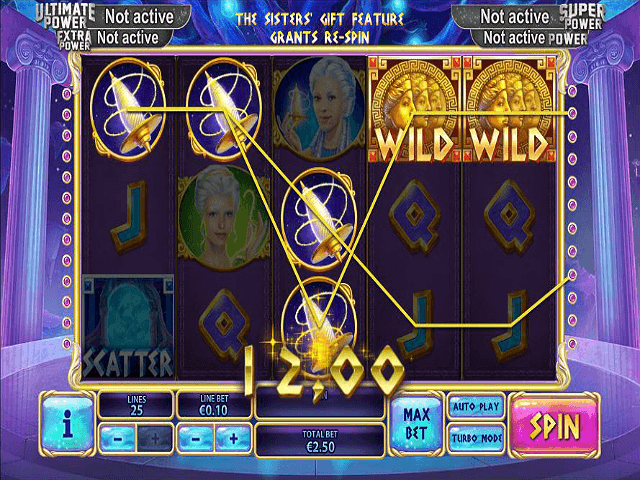 This Greek mythology-themed slot is based around three sisters who can bring you wealth and riches. Get to know more about this thrilling title in our Age of the Gods: Fate Sisters guide. Play Age of the Gods: Fate Sisters for Real Money! 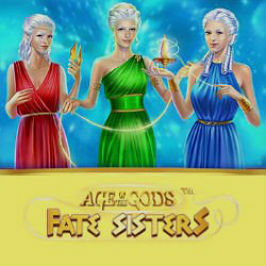 The Fate Sisters video slot is the latest addition to the Age of the Gods series from software provider Playtech. This slot is all about the enticing progressive jackpot, where one single spin could bankroll your way to a tropical island. You can play with just 25p per spin and a maximum bet of £250. The Fate Sisters theme is all about Clotho, Lachesis and Atropos, who were the daughters of gods Erebus and Nyx. These sisters will decide the fate of every mortal, god, Titan and player seeking to part them from their jackpot. This jackpot slot is packed with features and Free Spins too, with a return to player of 92.03%. 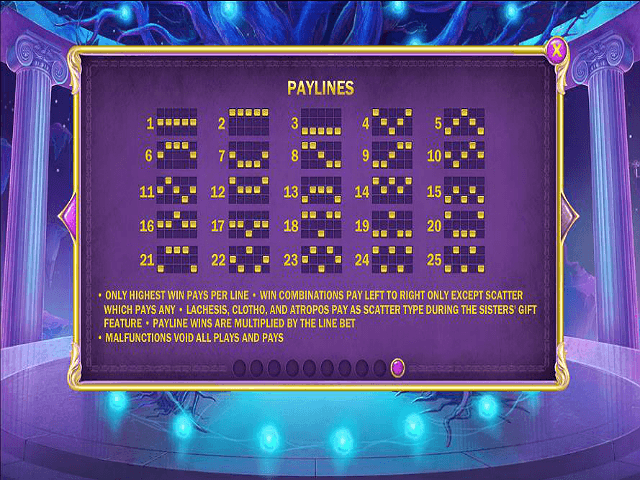 The Fate Sisters slot game is easy to play, with the high value symbols represented by Lachesis, Clotho and Atropos, and the lower value symbols being 9, 10, J, Q, K and A. The Wild is a gold symbol with all three sisters and it’ll substitute for all other symbols bar the Scatter. 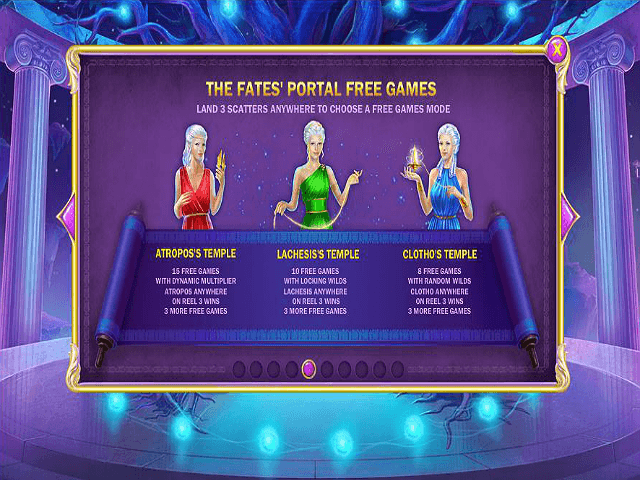 Look out for the 'Fates Portal' Free Spins game, which is activated when three Scatters appear on the reels. When this is triggered, you can pick from one of three Free Spins features and hit up some tempting payouts. There's no need to worry about getting bored of this title, as there are plenty of slot game bonuses within. A Re-Spins feature keeps the wins coming in, while the three Free Spin bonus games offers up to 15 Free Spins, 5x Wilds and excellent payout potential. Big wins can be hit thanks to the Multiplier wins of up to 5x and the three random Wilds that can land on each spin. The Sisters’ Gift feature is triggered when you land Lachesis on reel one, Clotho on reel three and Atropos on reel five – this will reward you with a Re-Spin, with the sisters frozen for more wins. Here's where it gets exciting. The Age of the Gods Progressive Jackpot is randomly awarded on any paid spin of the reel. However, the higher the bet, the bigger the chance of scooping the progressive jackpot winnings. The jackpot is linked to the same pot as the Marvel jackpot network, so you can expect a decent payout! This is a multi-level progressive jackpot game where entering the jackpot guarantees a win of one of four jackpots. These are named (from highest to lowest): Ultimate Power, Super Power, Extra Power and Power. The maximum payout value of course depends on the coin value and how many lines are being played. The biggest win lies within the progressive jackpot game, where matching three Ultimate Power symbols can bring in the mouth-watering sum of $100,000. Ready to wield your luck and play for godly riches? Check out Fate Sisters now. Share this Age of the Gods: Fate Sisters Review today! If you like Age of the Gods: Fate Sisters, you'll love these slot titles too!